Technology advances have allowed for walking after bunion surgery despite bunion size, though the early walking program has to fit for both the patient and the surgeon. Bunion Surgery recovery is not as debilitating as it used to be. In my NYC bunion surgery practice, the prolonged use of casts and crutches is something of the past. Modern medical implants designed to hold the bones steady have allowed some surgeons to walk their patients right after their bunion surgery -- rather than be confined to casts and crutches. This can be done for bunions of all sizes. Bunion surgery generally involves repositioning the maligned bones with a bone cut (osteotomy) and/or bone mending procedure (fusion). As such, the time it takes for bones to set/mend in the corrected position generally takes six weeks. Smokers and those in poor medical health may take longer to mend the bone. The biology of bone healing is about six weeks -- that time frame can't be made quicker. What can be changed is the disability that one experiences while the bone is mending. When Is Walking Possible After Bunion Surgery? Historically, the size of the bunion generally dictates whether or not a surgeon would allow walking. 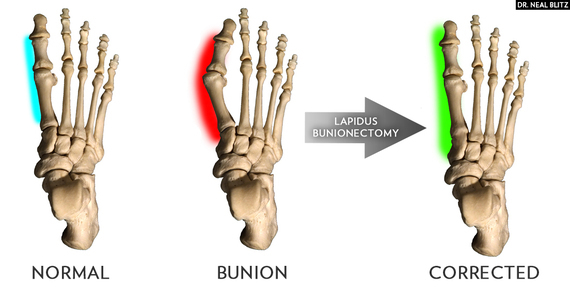 Smaller bunions have allowed walking in a surgical shoe whereas larger bunions have required casts and crutches. Larger bunions require more involved bone work, which lend itself to instability with walking pressure and therefore surgeons have used casts and crutches. Nowadays, technology and surgical experience have demonstrated that walking is indeed possible (casts and crutches are not needed) with specific techniques and specialized implanted surgical hardware. The Benefits Of Immediate Walking After Bunion Surgery. Less Down Time. Without the anchor of a cast and crutches, patients are able to resume their routines much quicker. In many cases, walking after bunion surgery means patients can get around but not run around. Patients are generally walking in a surgical shoe and usually keep weight on the heel or outer edge. *While casts and crutches are generally not needed for prolonged use, some patients use find crutch use beneficial for comfort during the first few days after surgery until the acute pain subsides. Some are able to get back to work soon after surgery, especially when their jobs are more sedentary. Nonetheless, being mobile earlier leads to more rapid return to overall function. Avoid Cast/Crutch-Associated Limb Problems. Cast and crutch use is associated with lower limb muscular atrophy (requiring weeks of rehabilitation) and upper extremity fatigue. Being immobile and sedentary after surgery and can lend itself to swelling and serious blood clots. Obviously avoiding these issues is advantageous.